Tyler Palko was a leader from the moment he picked up a football while watching his father coach at West Allegheny High School. His prowess only grew during a career at the University of Pittsburgh where he was arguably one of the best quarterbacks not named Dan Marino. Now, after an abbreviated pro football career that saw him suit up for six teams in five years, he continues to draw on his leadership abilities as a coach for an executive management firm in Arizona. Through it all, Palko said the world of sports was the basis for his success, and he hopes it continues to influence him and others he reaches in the future. “When you play sports, you have a leg up on people. There’s no better training tool for life,” Palko said. Growing up with a dad as the football coach at West Allegheny fostered Palko’s interest in sports. Bob Palko realized his son’s potential, but let him to pursue his own calling. “I could tell early on Tyler had a true joy for competition and easily expressed himself athletically,” Bob Palko said. He remembers his son as being a gym rat who easily excelled at several sports throughout his high school career. But both father and son noted that their relationship on the field was strictly all business. “My dad was never self-promoting; he genuinely cared about all the kids and to me he was always Coach Palko,” Tyler Palko said. He admitted that his dad’s discipline molded him to set himself apart from the crowd at such a young, impressionable age. One of the most difficult calls to make was to Penn State defensive coach Tom Bradley. Bradley said Tyler Palko possessed not only respectable athletic ability, but also a strong commitment that paired with outstanding leadership qualities. “He had displayed an uncanny poise when presented with difficult game scenarios in high school. His knowledge and overall feel for the game was impressive, and most importantly, he was committed to playing the game of football,” Bradley said. Bradley had hoped to recruit Tyler Palko to his Nittany Lions team on the other side of the ball playing defense. He believed that Tyler Palko could have been a tremendous strong safety in his system at Penn State University. “The position of strong safety calls for athletic flexibility, linebacker toughness and an exceptional physical and mental skill set, which Tyler had more than clearly demonstrated,” he said. 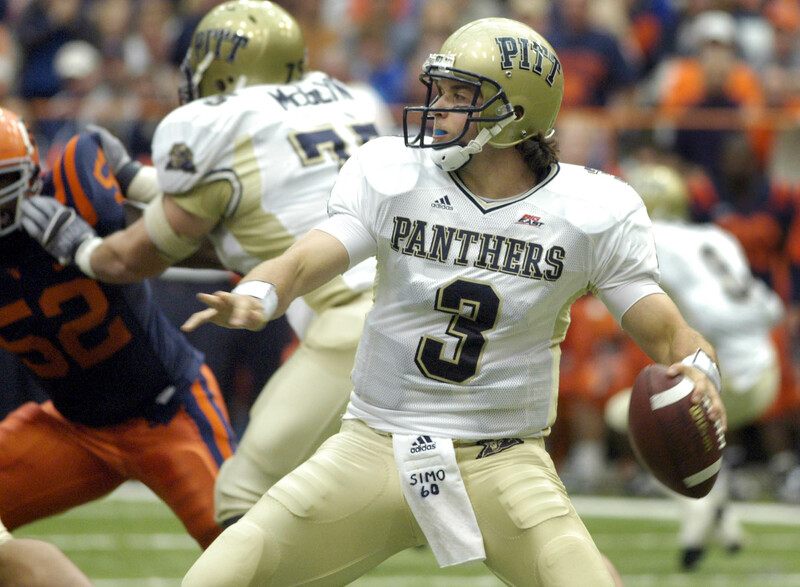 Tyler Palko accepted the University of Pittsburgh’s offer in 2002 and by 2004, he was considered one of the hottest quarterbacks in the nation. 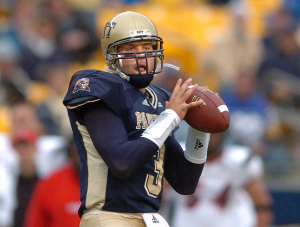 Some of his honors included two-time second-team All-Big East selection (2005 and 2006), third in school history for career passing (8,343) and being ranked second all-time in Pitt history for total offense. The left-handed thrower also held down captain of his team in 2004-2006, making 35 consecutive starts at the quarterback position. He competed for the position against Super Bowl champ and MVP Joe Flacco, who coincidentally decided to leave the Pitt program after Palko beat him out for the starting job in 2005. E.J. Borgetti, sports information director at the University of Pittsburgh, fondly recalls Palko as being an outstanding leader. “As a quarterback, I always saw Tyler as the perfect field general: confident, knowledgeable and, at the right times, fiery. He is in my opinion, an ‘all-timer’ at Pitt as both a quarterback and a person,” Borgetti said. After finishing his college career in 2006, Palko signed with the NFL’s New Orleans Saints as a free agent. He bounced from the Arizona Cardinals in 2009 to a short stint in the Canadian Football League before returning back to Pittsburgh to play for the Steelers. His greatest NFL success came in 2011 as a backup to the then Kansas City Chiefs quarterback Matt Cassel. Tyler Palko was moved to starting quarterback after Cassel suffered a broken hand injury, which finally gave him the opportunity to show off some of his skills in the professional level. 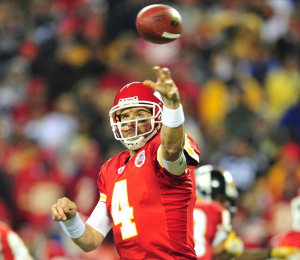 In his second game with the Chiefs, Palko found himself back in Pittsburgh, this time opposing his hometown team in a heated match. Although his first two career NFL touchdown passes came the following weeks against the Chicago Bears and the New York Jets, Palko was released after the 2011 season. He approached the situation with candor. After leaving professional football, Tyler Palko moved with his fiancé and 2-year-old daughter to Scottsdale. He said he hopes to one day take over the company, Solutions21, where he is currently employed as the “quarterback of the organization” in an executive coaching and leadership position.